Die Ausstellung Troubling Research. Performing Knowledge in the Arts zeigt Ergebnisse von Untersuchungen, Diskussionen und anderen Prozessen, die im Rahmen eines vom WWTF geförderten gleichnamigen transdisziplinären Forschungsprojekts an der Akademie der bildenden Künste Wien stattgefunden haben. Die am Projekt beteiligten Künstler_innen und Theoretiker_innen verhandeln das institutionelle Begehren nach Kooperationen von Kunst und Wissenschaft und setzen die neue disziplinäre Formation, die sich unter Namen wie “künstlerische Forschung oder “arts-based research” derzeit an den Kunstuniversitäten etabliert, argumentativ-ästhetisch unter Druck. With Daniel Aschwanden, Magdalena Barthofer, Anna Demmelbauer, Maria Foessl, Sophia Hatwagner, Teresa Kurzbauer, Dora Kuty, Mario Nestelberger, Jasmin Schaitl, Anna Scherz, Tadzio Stein, Brigitte Zaussinger. In collaboration with ‘Troubling Research. Performing Knowledge in the Arts‘ at the Institute of Art Theory and Cultural Studies, Academy of Fine Arts, students at the Institute of Art and Communication at the University of Applied Arts Vienna and students at the Academy of Fine Arts Vienna. Funded by WWTF Arts & Sciences Call, ‘Social Sciences and Humanities in Vienna’. READING A B C … findet als Setting 1 des Projektes The Purloined Letter/Der entwendete Brief von Johannes Porsch in einer Zusammenarbeit mit Sönke Hallmann (Department of Reading), Tanja Widmann und Inga Zimprich (Faculty of Invisibilty) statt. A B C … wird als Reading in drei Sessions durchlaufen. 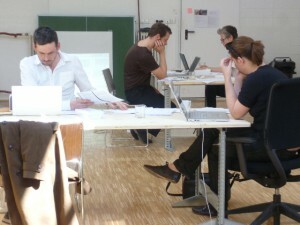 Armin Medosch’s lecture, organised by the WWTF Art(s) and Sciences research project “Troubling Research. 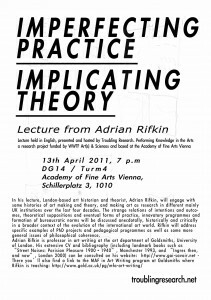 Performing Knowledge in the Arts”, will be based on his PhD thesis-in-progress “Automation, Cybernation and the Art of New Tendencies (1961-1973)” (Arts and Computational Technology, Goldsmiths, University of London, Digital Studios). The thesis interrogates the project and international art movement New Tendencies (NT) which originated in Zagreb, former Yugoslavia, in 1961and lasted until 1973. 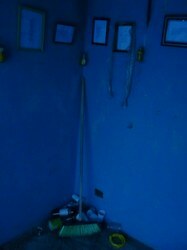 The basic methodological assumption behind Medosch’s research is that new insights are gained by questioning the various interdependencies between an art movement such as NT and the concrete historic development – in this case the struggle for hegemony during the Cold War and the techno-economic paradigm of Fordism-Keynesianism. NT can be divided into two phases, an initial phase between 1961 and 1965 when NT first emerged as a movement and produced ‘programmed art’ without using computers and a second phase from 1968-1973 dedicated to ‘computers and visual research’. Medosch’s presentation for “Troubling Research” will exclusively focus on the first phase. Display von Forschungsergebnissen von Stefanie Seibold im Rahmen des WWTF-Forschungsprojekt Troubling Research – Performing Knowledge in the Arts. 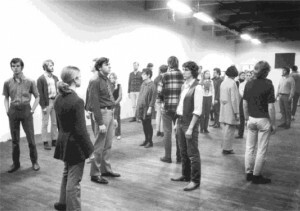 Participants: Philip Auslander, Martha Wilson, Barbara Clausen, Carrie Lambert-Beatty, Judith Hopf, Amelia Jones, Veronika Merklein, Bernadette Anzengruber, Teresa Novotny, Susanne Neuburger, Sabine Gebhardt Fink, Margarit von Büren, Simone Forti, Khadija Carroll, Amelia Jones, Lilo Nein, Constanze Ruhm, Hans Scheirl, Stefanie Seibold, Andreas Spiegl, Andrea Fraser, plus students of the Academy of Fine Arts Vienna. Based on the continual increase in the presence of performance art in exhibitions, the art market and in art theory debates, the symposium will reflect on how teaching and research that deals with performative art production can be conceptualized and carried out at an experimental art university. This reflection will be situated in Vienna, a key site of international performance history that can be linked to significant impulses in performance art through Viennese Actionism and contributions to feminist discourse. This conference will deal with a range of fields including art theory, teaching, research and curatorial practice, based on the idea that for decades already these fields have been subject to expansion and that remarkable overlaps between these fields have taken place. The conference will inquire into the practices and modes of operation that constitute this contemporary overlap of knowledge production. Vortrag findet im Rahmen des vom WWTF geförderten Forschungsprojekts “Troubling Research. 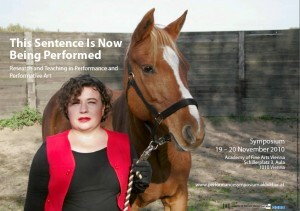 Performing Knowledge in the Arts” statt. Michelle Kuo is editor-in-chief of Artforum. She is also a Ph.D. candidate at Harvard University in the History of Art and Architecture, writing a dissertation titled “To Avoid the Waste of a Cultural Revolution”: Experiments in Art and Technology (E.A.T. ), 1966-1974. Kuo has written extensively for publications including Artforum, Bookforum, October, The Art Bulletin, and TDR/The Drama Review and is the author of “9 Evenings in Reverse,” in the exhibition catalogue 9 Evenings Reconsidered: Art, Theatre, and Engineering for the MIT List Visual Arts Center in 2006. Forthcoming essays will appear in exhibition catalogues for MuMOK, Vienna, and the Hayward Gallery, London this year.